Will we stick to Initiatives model? In June 2016, we switched most of the people inside our company to open allocation. They have the freedom to start their own initiatives that are aligned with the central goal of providing a better user experience and fixing critical problems in Targetprocess product. 10 months have passed, and we can now analyze the experiment results. In this post I'll share my opinion about the experiment and mix it with the opinions of the people who participated. Here is the current initiatives Roadmap. A very good thing is that almost all initiatives were implemented on time. It means people respected their commitments and did their best to keep promises. A bad thing is that some of the implemented features were still not deployed to production servers due to huge infrastructure changes caused by the microservices approach. Basically, you can't give a promise to release something when the infrastructure is not ready. Another trivial observation is a struggle to fit R&D activities into the Initiatives model. If a team doesn't know how to attack the problem, it created "Research initiative", thus we timebox research. Then, when a solution is found, the team starts a usual Initiative with the results. Overall, we wanted to solve the problem of speedy delivery, and we got mixed results. Yes, most features were implemented on time, but the infrastructure held them back. Small Lesson #1. People don't like deadlines, but... deadlines work (when you have no problems with infrastructure). Deadlines lead to cut corners, worse quality, and poorer solutions. In my personal opinion, this is not a huge problem, since you always have to balance quality and time. Estimates are not forced and, overall, teams have enough time to complete features with good quality. It inspires people to take ownership of our product. A good practice for freedom, responsibility, and trust. People feel more passionate and responsible about what they build, I guess. We finally have kind of deadlines, that we stick to. We have a clear definition of done for features, with clear deliverables such as product demo, blog post, working piece of software etc. It seems we deliver better quality, faster and more often. Initiatives force you to focus on a single task. It improves timely delivery, but hurts mutual help. You might think twice to dedicate several hours of your time to help someone from another team. Sometimes it is good, but sometimes it can lead to local optimization. Sure, you will have your feature delivered on time, but from a company level your help may be extremely valuable. I think this trade-off is OK. If you like to help other people, you can act in the Free Agent role rather than join an initiative. Or, you become more creative and try to teach people quickly instead of doing everything yourself. This got worse. Ideas are quite diverse and I hoped to have an emergent vision as a result. I don't think it happened though. We indeed fixed several important problems, but some of the top problems are still there, like extremely poor notifications. I defined a wide goal to improve UX and increase NPS, but this goal was too broad and almost all features can be stretched to fit this goal. In my opinion, this lead to a slight feeling that our direction is unknown and the product has no vision. Small Lesson #2: Define a bold goal for the year and quite narrow goals for the quarters. The scope we do is driven by someone's desire but not by market demand. Sure, there is a filter which guarantees that useless feature won't pass. But this filter doesn't guarantee that necessary feature will go into development (because nobody would like to take them and HEADs cannot force). Important items can be in a backlog for years. One of the worst decisions we've made is a reward for successful Initiative completion. Teams that complete an Initiative got several Orange Days (which can be converted to Days Off). This immediately downplays the contribution of all people outside Initiatives. Initiatives violate our core value: trust. A company should trust that their people will do their best to get a job done. Initiatives might give off the impression that "we don't trust you will do great work without a reward, so we give you a bonus that will stimulate you to complete work on time". It is assumed that development speed is low due to lack of deadlines, but in reality, complexity of integration and some external blockers are the cause. Some one still needs to do the "dirty jobs" and I don't think that it's fair that this work is not rewarded with orange time. We wanted to stimulate the Initiatives practice with an additional reward, but it was a bad idea. In fact, freedom of choice and regular intrinsic motivation is enough to make great things. Small Lesson #3: Don't underestimate intrinsic motivation. Another mistake we've made is poor guidance. Yes, I wrote about the practice, ran clarification sessions, and answered questions. But after this initial kickstart, I did a poor job of supporting and promoting it. I should have worked with key people and ran educational session about how to define top problems, how to do UX, how to test results, etc. Self-organization requires good skills and great understanding of the business context. 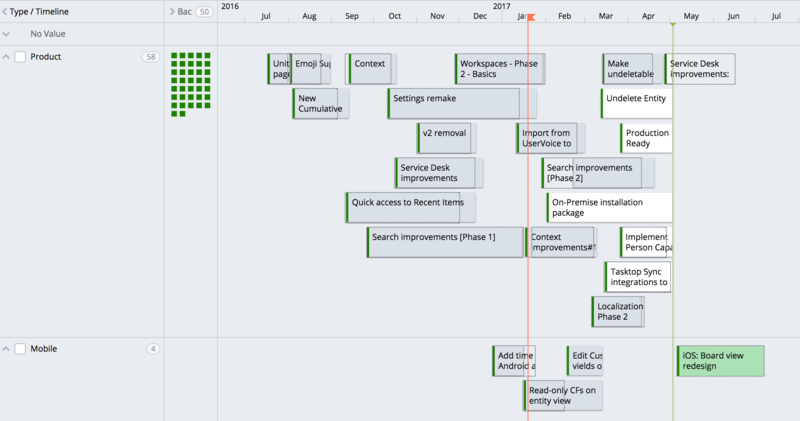 I relied on cheap self-organization, but this doesn't work in the complex environment of a B2B SaaS company. Huge lesson #4: Adaptive self-organization demands high energy costs. 20% of people should be highly experienced, have deep understanding of business context and good understanding of product development practices. If you don't have it, run training programs and maybe in a year people will be ready. Information transparency is extremely important. You should have a process to collect requests from customers using various channels, aggregate their feedback and help people to distill top problems to focus on. Be careful with bonuses and rewards. By default it is easier to not have them at all. Choose own tasks from a story > Choose own stories from a backlog > Choose large features from backlog > Participate in backlog creation > Choose anything you believe is right. If you jump to complete freedom from the typical Scrum practice of "Choose own stories from a backlog", people will feel frustration. Help them one step at a time. I think we will go one step back and let people choose features from a backlog and participate in backlog creation, running required training programs for product development in parallel. With more experience we will restart the Initiatives practice. It is fun and works quite nice, but we were unprepared for it as a company, and I was unprepared for it as a leader.